I have an admission to make and please stop me if you have been guilty of this same feeling or thinking as well: there are times when I don’t feel an extreme rush or urgency to pay off my credit card balance simply because there is no visible harm being done. Accumulating interest rate? who cares, it is only a few bucks every month. Bad credit? that is another thing we forget to worry about just because we don’t get to see its impact on a daily basis. Worse yet, some of us have stopped worrying about paying off our credit card debt because what is the point, sooner or later, we will max it out again. So might as well just use our credit cards as we fill up our cars when the gas is expensive: simply top it up and pay as you go. Never filling it up. Welcome to the new generation that never worries or loses sleep over their credit card debt. It is never a bad thing when you don’t let stress get to you, but in this situation, it may be good to feel some stress and urgency to pay off your credit card debt (and other debt for that matter.) I am sure credit card companies love this new generation: it will just mean more interest being paid. If you don’t pay your credit card balance on time and still not feel any guilt, there is something wrong. Sure, you may not have the money to pay it, but that doesn’t mean you should be OK with the situation. If anything, you should have a plan in hand to pay off your credit card balance or at least reduce it to a manageable sum. If credit card debt doesn’t bother or concern some people, it means that taking on big items that they can’t afford, will probably not bother them either. Be it a brand new car, a big house or a trip out of nowhere to a place out of this world. This is akin to a society where more and more people are not bound by the rule of law and order or the police. In such a society, chaos and problems will ensue and a whole collapse of the system is possible. The same applies here, when more and more people are no longer bothered by their credit card and other financial obligations, and in fact are fine living with it. Such a society can’t be sustained and will eventually come down crashing. It is already happening in one form or another in the US. 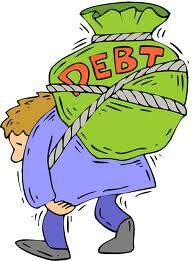 Pay off your credit card debt and save yourself hundreds if not thousands in interest every year. So why refuse extra money that can be in your pocket? If you don’t want to be bothered by your debt, there is a simple thing you can do: pay it off and stop using them as much as you can. Kill your debt before it finishes you.